An excerpt from the tourist flier shares a desperate call for help from General Washington. Notwithstanding the discouraging Accounts I have received from Col:Reed of what might be expected from the Operations below, I am determined, as the night is favourable, to cross the River, & make the attack upon Trenton in the Morning. If you can do nothing real, at least create as great a diversion as possible. Turns out they did nothing. 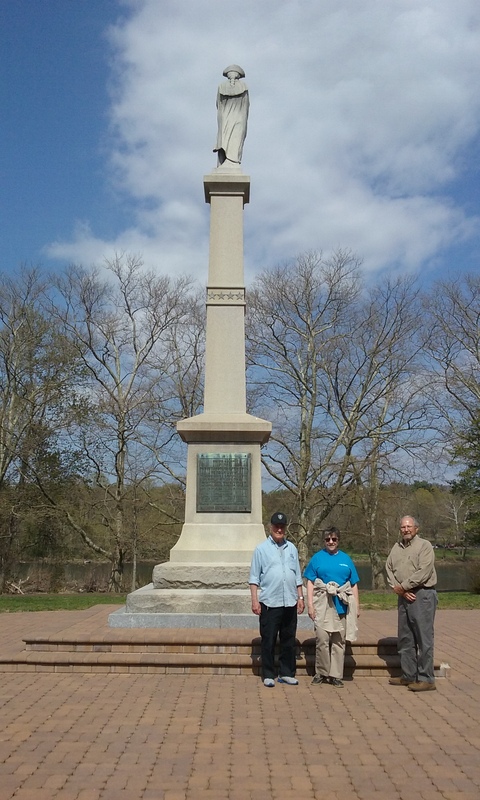 It wasn’t Christmas day, nor was there ice, snow and wind, rather a beautiful warm spring day that during an outing in and around Philadelphia we happened on the historic town of Washington Crossing, PA. According to tradition this is where Washington and his aides ate their dinner prior to the crossing of the Delaware River on Christmas Day during the Revolutionary War of 1776. Additions were made to the inn in the late eighteenth and early nineteenth century by the Taylor family. This building continued to serve as an inn for decades. 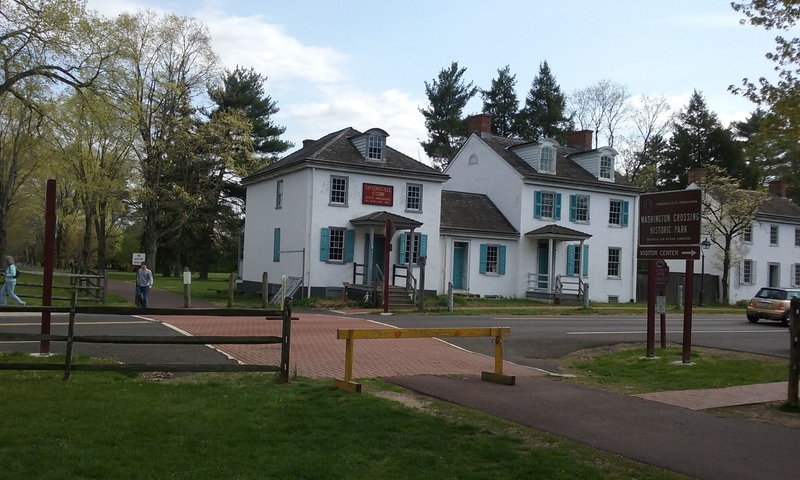 We entered the historic park visitor center to find this statue of George Washington looking over the site very near to where the crossing took place. Today it offers this beautiful view of the River. 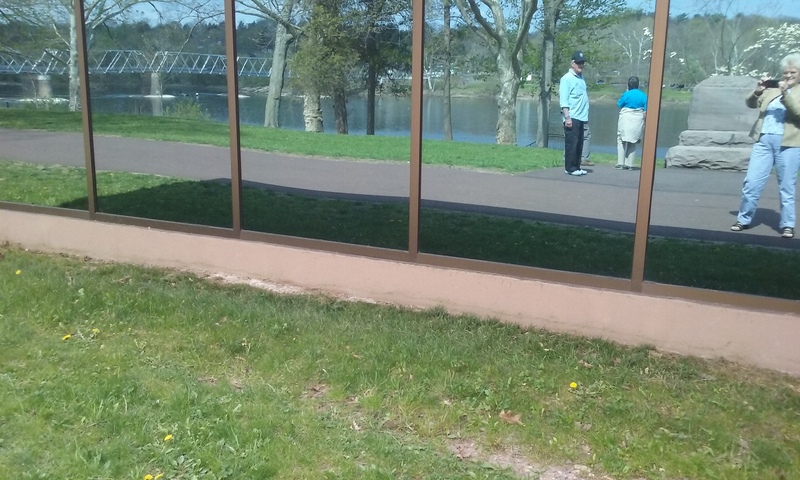 Strolling down the park avenue, we got this reflective view of ourselves and the river. Next the 20th century structure that houses the Durham boat replicas. 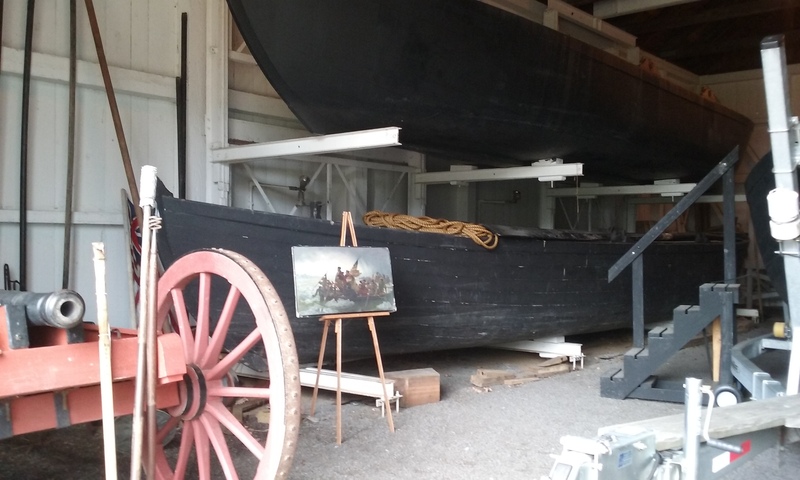 Originally used to haul iron ore, the Durham boats were the sturdy craft used by Washington and his men for the crossing. Today these boats are a key component of the annual reenactment of the crossing on Christmas Day. The Taylorsville store was owned and operated by Mahlon K. Taylor around 1817 and also functioned as the Post Office. 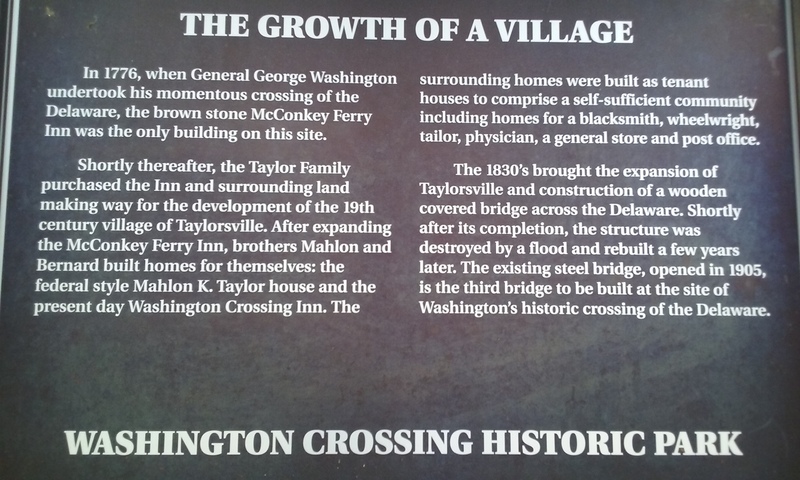 The town, which is now known as Washington Crossing, was then Taylorsville. 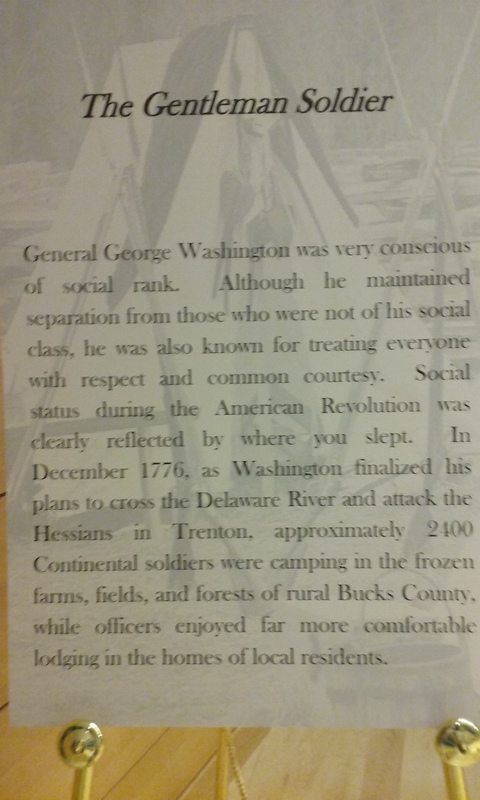 In the museum I found this sign which described the person of General George Washington. 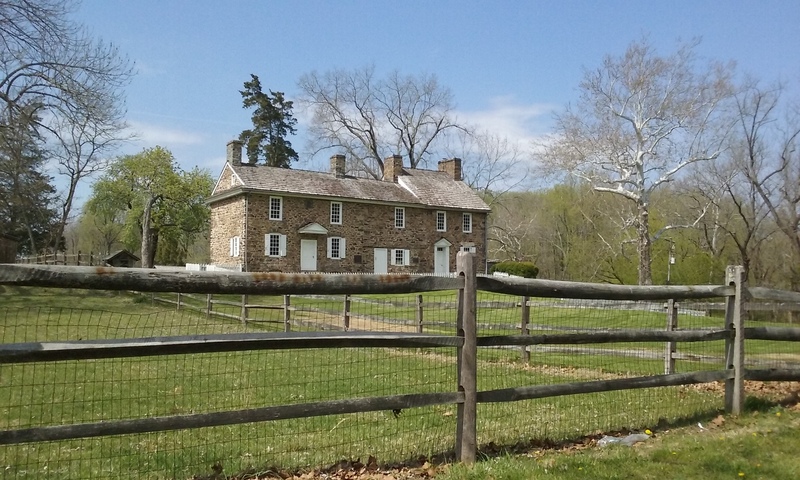 Completing this blog is the beautiful Thompson – Neely stone house, an example of the eighteenth century architecture located along Pidcock Creek. 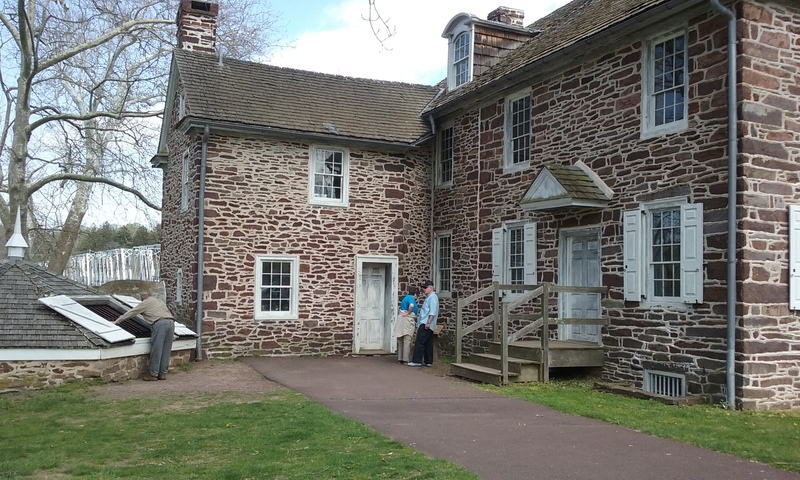 It was used to aid and care for convalescing soldiers healing from wounds or suffering from diseases and camp illnesses during the winter of 1776-1777. “Fully expecting to be supported by two divisions south of Trenton, Washington assembled his troops near McConkey’s Ferry in preparation for the crossing. By 6 PM, 2,400 troops began crossing the ice-choked river. The operation was slow and difficult due to the condition of the river. An abrupt change in the weather forced the men to fight their way through sleet and a blinding snow storm. These obstacles proved to be too much for the supporting divisions led by Colonel Cadwalader and General Ewing. 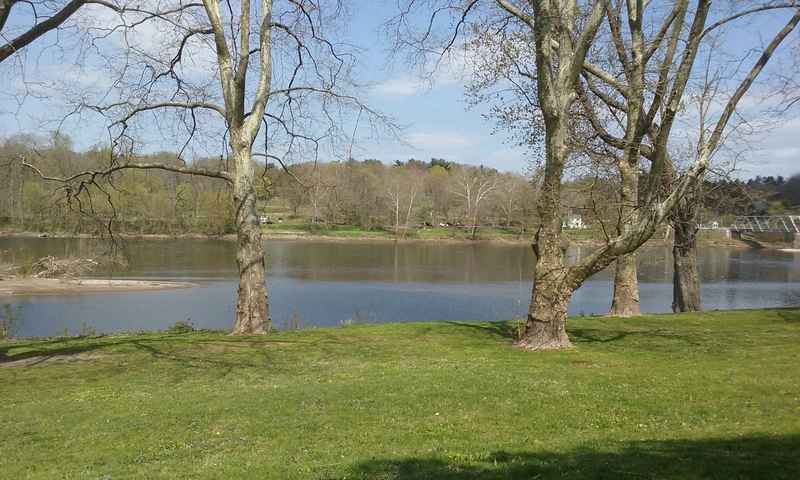 Ultimately, their attempts to cross at southern points along the Delaware River failed. In case you are wondering, as I was, the Hessians were a group of German mercenary soldiers who were celebrating the Christmas holiday and in no way prepared for an early morning attack. I recently finished a school year of teaching world history to senior high students from a home school co-op group. So this find was more than enjoyable to me. I hope you found it interesting, and if you are ever in the area, I believe a visit is very much worth your time.